An exercise with a multitude of benefits, such as mobilising the spine, opening the hips, strengthening the glutes, increasing awareness of posture, muscle balance and increasing pelvic stability. This is a pelvic curl ‘level’ bridge suitable for the majority but not all (for example neck injuries) so please contact me for advice before performing the exercise if you are unsure. 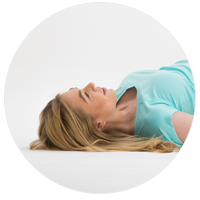 Begin by organising your body on the mat or floor in a ‘neutral’ position, laid on your back with your knees bent, feet placed on the mat in line with your sit bones (parallel), feet and knees hip distance apart, a long spine, arms resting down by your sides. Inhale to prepare, engaging your core, imprinting your spine and then exhale as you start to peel your spine up from the mat one vertebra at a time. Try visualising your spine as a bicycle chain whereby you lift it from the mat without missing out a single link. Once you reach the top of your bridge (where knees, hips and shoulders are in a line) inhale, then exhale as you place one vertebra back down on the mat at a time all the way back to the tailbone. Repeat, using control and with awareness, concentrating and focusing on any parts of your back where you find it particularly difficult to articulate one vertebra at a time. You may also choose to start just lifting a couple of vertebrae before rolling back down and then increasing your range of movement with each repetition. Highly recommend this class to anyone. Caroline explains every move really thoroughly and in a fun way too. I come out of the class feeling happy, relaxed and several inches taller (great when you're 5ft 2in).